Notes: This title was previously given a bare bones DVD release. Many scholars have pontificated as to why Hitchcock chose to adapt Helen Simpson’s Under Capricorn as what was originally intended to be the première Transatlantic Films production. The major studios had all wisely passed on optioning the property. In fact, they had also passed on the other properties purchased by Sidney Bernstein and Alfred Hitchcock for Transatlantic. Under Capricorn, Rope, Stage Fright, and I Confess were all considered inappropriate material in which to build a suitable film script. Few if any of these historians seem to have given any consideration to the possibility that these “passed over” properties may have been the only ones that the budding production company could afford. It is doubtful that they would be able to outbid the major studios on more promising subjects (although Rope and I Confess are both incredibly underrated). This is only conjecture but it seems a reasonable possibility and one wishes that this avenue could be explored in more depth. Alfred Hitchcock always claimed that he chose the property because he felt that Ingrid Bergman would respond to the material and that he was so absorbed with signing the actress to a film that this became his only consideration. This makes sense when one considers that the director was enjoying his first taste of freedom after being emancipated from the shackles of his contract with David O. Selznick. It was more important for the director to distinguish himself as a producer than to satisfy his own creative interests (at least when it came to his material). Under Capricorn was to be a star vehicle to rival those that Selznick was so fond of producing, and the fact that Bergman had already refused to sign another contract with Selznick would have made this victory even sweeter. Unfortunately, Selznick had been able to procure prestigious properties and Hitchcock was stuck with a rather tedious novel that borrowed heavily from much better pieces of literature. Hitchcock’s film is thankfully much different than the convoluted mess that Simpson originally concocted. Her story is divided into three sections, and Hitchcock’s film only follows the first of these before providing a more coherent denouement. His final act has been criticized for being rather weak, but it must be said that reading the original novel gives one new respect for Hitchcock’s conclusion. …Adare proceeds to court Susan, visiting her at her father’s barbershop on George Street. Around the same time, Adare enlists the help of ‘Ketch,’ the aboriginal leader introduced (none too sympathetically) following Adare’s first dinner with Flusky, to embark upon a treacherous journey north to Port Macquarie and then inland to unknown territory in search of gold. Milly has spread vile rumors that Adare and Henrietta are lovers, and Flusky (mildly suspicious of Adare) is quick to agree to fund the expedition. Convinced that Flusky has effectively delivered Adare (in repetition of her brother’s fate) to his death, Henrietta becomes despondent and turns to drink. Although, it goes without saying that Under Capricorn isn’t amongst Hitchcock’s best work, it is impossible not to admire how he transformed this convoluted mess into something that resembles a reasonably coherent narrative—although he may have been aided by an earlier dramatization (most likely written for the stage but never produced) by John Colton and Margaret Linden. Their play had also seen fit to jettison some of the book’s later subplots but also confined the action to the Flusky mansion. Having never seen or read this adaptation, it is best not to make any assumptions as to any similarities between it and the film version. In any case, one completely loses interest after the first section of Simpson’s meandering novel, but Hitchcock and his writers were able to trade this nonsense for a resolution that examines some of Hitchcock’s pet themes regarding an innocent carrying the burden of a wrong that isn’t their own. It comes as no surprise that the French critics loved it! Unfortunately, the film’s pacing is constricted by the kind of long monologues that plague so many of the era’s costume dramas. The director was never able to find an appropriate writer and settled on inappropriate collaborators. 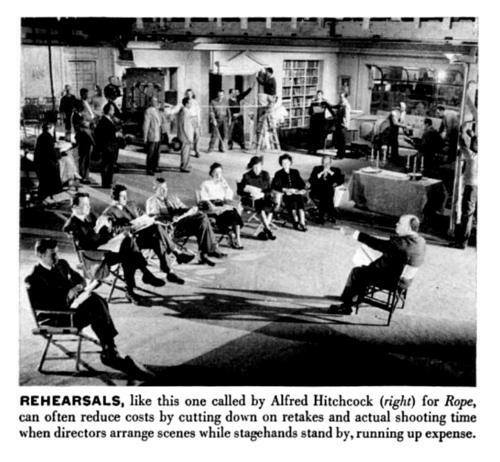 This tendency to blame Hitchcock’s visual approach for the film’s failure is ridiculous, but there were certainly issues that should and could have been addressed and the director was well aware of them when the team was working on the script. Interestingly, the director originally tried to engage Bridie to write the script to Under Capricorn after finishing his work on The Paradine Case (a Selznick production that has its own script issues) and turned the project down. How anyone could judge Simpson’s novel as anything better than mediocre is a mystery, but perhaps this isn’t important since he later relented and agreed to work on the project. The script wasn’t the only aspect of the film’s production that gave Hitchcock headaches and the director felt that the film’s casting compromised the film’s verisimilitude. This statement about the inappropriateness of Joseph Cotton in the role of Flusky isn’t merely the lamentations of a disappointed filmmaker who suddenly becomes aware of something after the fact. During the film’s pre-production, Hitchcock actively sought Burt Lancaster, but the actor required too much money and had other obligations. The production couldn’t be pushed back, and Bergman’s salary had already taken a considerable chunk out of the budget. He would have to find someone else, and that someone ended up being Joseph Cotton. Hitchcock had originally sought Burt Lancaster for the role of Sam Flusky as he believed Cotton too distinguished and charming to portray an ex-stable hand. One can understand why audiences may have been unable to accept Cotton as an uneducated, manure smelling, brutish groom—but this isn’t such a problem for modern audiences. Frankly, Cotton’s portrayal frees the character from the sort of stereotypical trappings of such characters. Is it outside the realm of possibility that a poor stable-hand might also be intelligent and charming? In any case, this has never been one of the more troubling aspects of Under Capricorn. After all, it is rare to hear anyone complain about Ingrid Bergman’s accent as Lady Henrietta Flusky which isn’t convincingly Irish—a fact that wasn’t lost on the actress. Her inability to give her character a proper Irish brogue plagued Bergman throughout the film’s production and exacerbated an already stressful situation. “…Oh dear! This is my seventh week waiting. [Under Capricorn] started O.K. [on] the 19th, but with Hitch’s ten-minute takes they were behind one week after one day’s shooting. The technicians here have very little or no experience—and they don’t seem to care. I have been waiting and waiting, but every day it is the same: ‘We didn’t get the shot today, but for sure we’ll have it tomorrow morning.’ Finally after four days I was told [that] Hitch had abandoned the shot and would start with my entrance. I was so happy. [We] rehearsed and at two o’clock the same day had the first take. During the second take all the lights went out, the electricians walked down the ladders and left. Strike! All afternoon we waited for them to finish their meeting, but they never came back. This morning I was up at six; at nine I was told they had not come back yet: ‘Just relax in your dressing room!’ I am outraged but the others seem to take it relaxed. Nothing new. After the war they always have a couple of strikes. The reason for the strike was that two men were fired because of bad work and coming late to work several times. The long takes that she mentions in this letter did create a few problems—some of which were not an issue during the production of Rope. However, any objective analysis of these troubles will reveal that most were beyond Alfred Hitchcock’s control. Could he be blamed for the various strikes that halted production (or the time lost when Michael Wilding took ill with pleurisy)? Absolutely not. In any case, the problems that were actually created by the long takes took a lot of ingenuity to solve. Jack Cardiff would often discuss his work on the film, and his memories weren’t happy ones. This strategy took the cooperation and agility of everyone on the set and this included the actors. …The Regency table that production designer Tom Morrahan built for Under Capricorn [were] cut into fourteen sections. It came apart to permit the camera to pass through. ‘The actors often helped,’ Cardiff writes, ‘and as the camera approached them seated nonchalantly enough, it looked positively weird to see them suddenly grab a section of the table, with a candle or plate of food fixed on it, and fall wildly out of picture … with their own parts of the table clutched in their hands.’ Mattresses were placed strategically behind the actors to catch them when they toppled backwards. She would try again while having drinks with the director and her two male leads. Somehow the conversation shifted to the long takes and she began complaining about the approach once again. Unfortunately, she made the mistake of turning away and he took this opportunity to leave her company. “That’s the trouble with Hitch,” the actress lamented, “he won’t fight!” This was true. Hitchcock loathed conflict and felt that drama should be reserved for the screen. Even so, it should be made clear that Hitchcock didn’t always ignore Bergman’s protests. When it was possible, he preferred to placate her by offering some sort of compromise that would allow him to have his way while seeming to bend to her will. Joseph Cotton was more worried about weaknesses within the script and his dialogue. As a matter of fact, he referred to the project as “Under Crapricorn” or “Under Cornycrap” (depending on which version of the story you want to believe) within earshot of his director and James Bridie (who had come to the set to adjust some of Cotton’s dialogue). Of course, it is quite possible that this comment was born out of his insecurities as an actor (he was never able to handle an authentic Irish lilt) and personal issues that were not at all related to the production as he was going through quite a lot in his personal life. The lengthy takes only exacerbated these simmering issues. The director himself may have privately cursed his sequence shots after having his toe crushed by the camera and the crane that held it. Perhaps this was a negative omen. Under Capricorn became the first British feature to have a world première at Radio City Music Hall on September 08, 1949 and had already accumulated $1,875,000 by this time on account of its world distribution rights. On September 17th, The Gloucestershire Echo reported that the film had already accumulated $2,000,000 but is unclear as to whether this amount includes the amount earned by selling these territorial rights (it is likely that it does). Either way, it seems that the film’s New York engagements were reasonably successful as the film played to “capacity audiences” for four weeks if newspaper reports can be believed. One assumes that the film was given a substantial boost due to the names of Alfred Hitchcock, Ingrid Bergman, and Joseph Cotton in the first week or two of release only to fall off in the following weeks. Whatever the case, Under Capricorn didn’t do enough business and was eventually repossessed by the bank that financed the project. In The Alfred Hitchcock Story, Ken Mogg proposes that Ingrid Bergman’s presence in the film may have contributed to its eventual failure. Of course, the senator had an agenda as he was proposing a censorship bill based on the “moral compasses” of those who work on any particular film. Such a bill sounds like an excuse to take away the inalienable rights of those who do not think or believe the same as Mr. Johnson and others like him, but this neither here nor there. The point is that this was months after the film’s initial release and it is doubtful that it had any effect on the film’s box-office earnings. It may have been a factor in the bank’s decision to repossess the picture but this is merely conjecture. Critics and audiences tend to excoriate films that don’t meet their expectations and have difficulty judging them on their own merits, so Under Capricorn never really stood much of a chance. Alfred Hitchcock often made mention of this in his interviews. “Under Capricorn is fortunate in having a number of exploitable angles that can be used to parlay sturdy initial grosses. On the long pull, though, box-office will be spotty. Ingrid Bergman’s name will be a potent help and there are Technicolor, Joseph Cotton, and Alfred Hitchcock as added lures to get ticket sales going, even though it doesn’t appear likely [that] momentum will be maintained in the general market. Of course, the French critics were enamored with the film and would eventually vote Under Capricorn into a list of the ten greatest films ever made in Cahiers du Cinéma. It’s hardly one of the ten greatest films ever made. Frankly, it isn’t even one of the ten greatest films in Hitchcock’s filmography. Unlike Vertigo, few Hitchcock scholars try to elevate the film’s reputation in the public consciousness. Books covering the director’s filmography tend to see it as a forgettable blemish on the face of the director’s career, and this is actually a pretty fair assertion. Unfortunately, the scholars making these assertions don’t seem to have any real understanding as to why the film doesn’t measure up to his greatest work. Spoto makes the mistake of assuming that the lengthy monologues were inserted to cater to the director’s lengthy takes, but they really only complicated them. If one will think back to The Paradine Case (which was also adapted by James Bridie and then given another polish by Selznick), they will recall that the film had a similar tendency of employing longwinded monologues and constant dialogue. This is a characteristic of Bridies writing. Unlike Rope, Hitchcock wasn’t trying to get through an entire roll of film without cutting. He simply employed this technique when it best suited the material. The truth—as is often the case—lies somewhere between these two extremes. Some films are neither brilliant nor terrible, but Under Capricorn was certainly a failure in the mind of its director, and Hitchcock’s tendency to adopt the prevailing critical opinion of his films has poisoned objective reevaluation. Obviously, many scholars seem to believe that the failure of Under Capricorn was due to the fact that Hitchcock insisted on carrying over the sequence shots he utilized in Rope, and these people aren’t thinking past the semi-formed opinions of other critics that plagued newspapers and magazines in 1948 when the film was released. The fact is that his approach to Under Capricorn is fundamentally different than the technique used in Rope, because: a.) This film wasn’t shot to look as if it was shot in real time, b.) Under Capricorn includes traditional cutting in conjunction with sequence shots while Rope consists only of sequence shots, and c.) it doesn’t make any effort to camouflage the film’s edits. In short, the technique used in Capricorn is a refinement of the experiment that he used for Rope. He is searching for the proper equilibrium between two opposing techniques and some of the director’s future work proves that he found it (even if it wasn’t perfected in this particular film). Hitchcock realized that there were flaws in his approach to Rope and is testing the sequence shot as an added tool to use in conjunction with other techniques. One can see a difference in his aesthetic before he made the two Transatlantic films and those that he made after them. He grew from these experiments and never completely abandoned the sequence shot. He confessed that he still admired the technique in a 1955 interview with Cahiers du Cinéma and this won’t come as a surprise to those who truly pay attention to his later work. This is an important point that seems to be lost on most critics and scholars. Hitchcock incorporates a wide array of shots into these long takes. The wide master, the two shot, the close-up, the extreme close-up, and the insert shot are all utilized. It isn’t as if he were simply pointing the camera at the actors and allowing the scenes to play out as if this were a play. What’s more, his use of this technique adds power to a number of the film’s traditional edits. Some of the cuts in Under Capricorn are dramatic solely because they happen to follow a sequence shot. Take, for example, Bergman’s introduction. We follow Adare as he meets other guests after arriving at the party, Flusky gives instructions to Milly regarding Mrs. Flusky (which makes the viewer curious about her), and the men finally sit down to enjoy a meal and say grace. Soon the guests notice something that is happening just outside the scope of the frame, and Flusky notices their attention and nervously begins turning his head to see what has captured their gaze. We then cut to Bergman’s bare feet as they move into the room and carry us back to Sam Flusky as she places her hand on his shoulders. Finally, we move to the intoxicated face of Ingrid Bergman. It’s quite the introduction. Hitchcock never abandons his devotion to the visual in this experiment, he simply expands and adds to the language of the medium. If Under Capricorn fails, it is due to the weak script and an arguably less interesting subject. It does not stand with Alfred Hitchcock’s best films—or even his second-tier titles—but it was an essential phase in his artistic evolution. What’s more, it isn’t any worse than a number of other overwrought and syrupy costume melodramas being made at around that time. One wonders if the film wouldn’t have a different reputation if another director’s name were written on it. Kino houses their Blu-ray in a standard Blu-ray case with a reversible sleeve that offers a choice of film related artwork. The default art is taken from the film’s original American One Sheet while a more lurid foreign poster was used for the reverse as an alternative. The American one sheet is the superior choice. In fact, Kino must agree with us on this point since it is this artwork that has been carried over for the disc’s static menu. Kino’s 4K restoration transfer is a huge improvement over the previous DVD editions of the film, and the improvement isn’t merely due to the added resolution. However, it must be said that the final result is less that completely satisfying and will probably disappoint some collectors. This doesn’t seem to be the fault of the restoration or the transfer but is instead the unfortunate symptom of the ravages of time. Damage and debris is evident, but the most significant problem here stems from the various color elements in the Technicolor print which has resulted in slight haloing. Luckily, this never becomes distracting. In fact, most people won’t notice it and will instead pick up on the obvious improvement over earlier transfers in terms of both vibrancy and clarity. Motion is also greatly improved upon here (something especially important considering the mobile nature of the image). Best of all, we get quite a bit more information in the frame in this new transfer. This is likely the best this film is going to look on home video at this point. The 2.0 English DTS-HD Master Audio is an admirable representation of the film’s original source elements. It doesn’t offer the dynamic sonic experience one expects from more recent films, but no one should really expect this. The film’s dialogue is well prioritized and clearly rendered and the music is given adequate room to breathe thanks to the high definition transfer. Fans should be pleased. Kat Ellinger has provided commentaries for a wide variety of films in recent years. As editor-in-chief for Diabolique magazine, she has a reasonably deep well of general knowledge to aid her in this track—but those expecting any in-depth information will be somewhat disappointed. Some of her analysis is interesting enough to keep the listener engaged, but it isn’t an especially focused discussion about the film (which she insists is underrated). She has a tendency to overlook important points and there are a few questionable statements along the way. This is par for the course with third-party “scholarly commentaries.” It is nice that she has included some general information about the careers of various cast and crew, and this is really the best reason to give the track a listen. Absolutely essential is this excerpt from Alfred Hitchcock’s infamous interview with François Truffaut as it finds the director speaking candidly about Under Capricorn. Those who have already read the book won’t learn anything, but it is nice to hear the director discussing this often overlooked film. It is illustrated with a still photograph of the two filmmakers that was taken during the interview sessions in 1963. The disc’s best supplement is probably this half-hour program that finds Claude Chabrol discussing a variety of Hitchcock related topics, including Cahiers du Cinéma’s infamous Hitchcock issue that would help change critical opinion of Hitchcock’s work, the equally important book that he penned with Éric Rohmer (Hitchcock: The First Forty-Four Films), an analysis of a scene from Under Capricorn (which was taken from the text of this book), Truffaut’s book-length interview Hitchcock, and his own analysis of scenes from Marnie and Frenzy. Fans will find this material fascinating even if they find themselves in disagreement. It offers food for thought and is a welcome addition to Kino’s package. While trailers for other Hitchcock titles are much more interesting and original than the rather standard approach used to market Under Capricorn, it is certainly nice to have the trailer for this film finally available on home video. We are also given a number of other trailers, including one for Hitchcock’s The Paradine Case (1947), Bergman’s Intermezzo: A Love Story (1939), Cotton’s A Portrait of Jennie (1948), and a remake of The Lodger (1944). This quote frames our parting thoughts admirably. Those who expect a typical Hitchcockian suspense story are bound to be disappointed. Under Capricorn is probably one of the director’s five weakest American films but it certainly wasn’t a waste of his time. In fact, it was an extremely important step in Alfred Hitchcock’s creative evolution. Kino Lorber’s Blu-ray includes the best transfer of the film currently available on home video and a very nice supplemental package. One cannot blame Alfred Hitchcock for feeling experimental after being under contract to David O. Selznick. 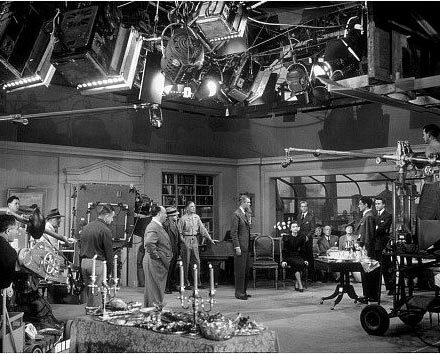 The director had already established a production company with Sidney Bernstein called Transatlantic Pictures in anticipation of his emancipation from Selznick. 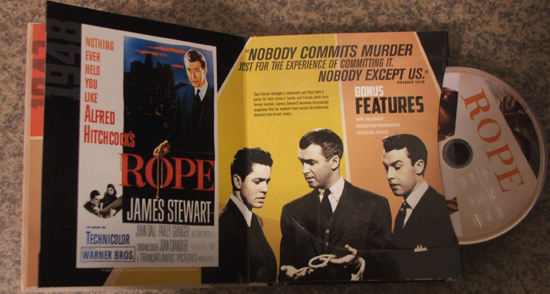 Rope ended up being the first of two films made for Transatlantic before the company was dissolved. “A long time ago I said that I would like to film in two hours a fictional story that actually happens in two hours. I wanted to do a picture with no time lapses — a picture in which the camera never stops. These uninterrupted takes are the focus of a lot of debate and is the primary focus of nearly everything that is written about the film (and for good reason). It was a first in cinema. An accomplished director was essentially risking his future success in order to advance his art and his understanding of cinema (even if he did not realize it). The production wouldn’t be an easy one. Even the subject matter was risky! The script needed special handling in order to get the unusual content past the censors. Laurents would combine dialogue from the play with his own dialogue. His script handled the subtext of homosexuality extremely carefully in order to appease the censors. 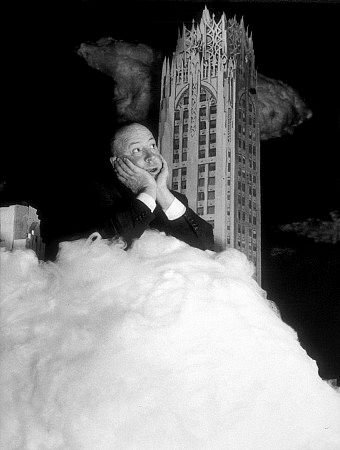 However, the censors would not be Hitchcock’s largest obstacle. 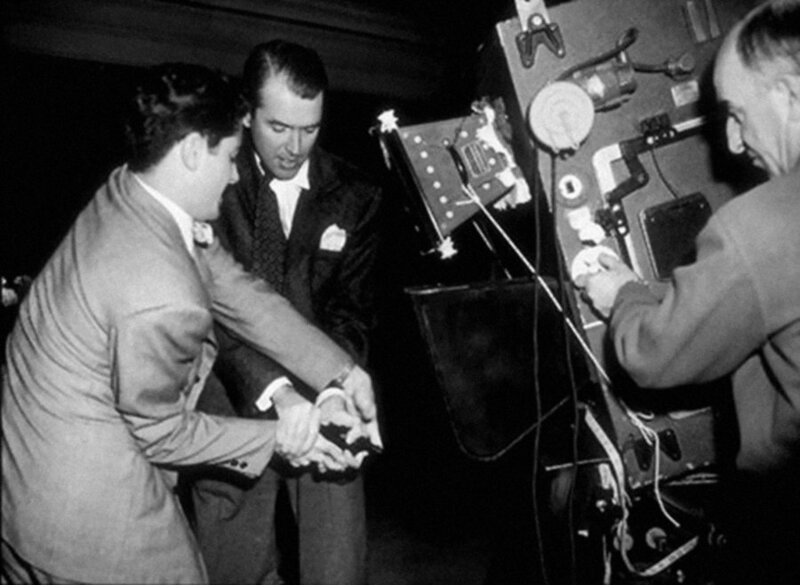 His new method of shooting would require a set that would accommodate his huge Technicolor camera. Surprisingly, the apartment itself was the least of his worries. The New York skyline that can be seen from the apartment window also created challenges, and these challenges only stimulated the director’s excitement for the project. “…The most magical of all the devices was the cyclorama — an exact miniature reproduction of nearly 35 miles of New York skyline lighted by 8,000 incandescent bulbs and 200 neon signs requiring 150 transformers. 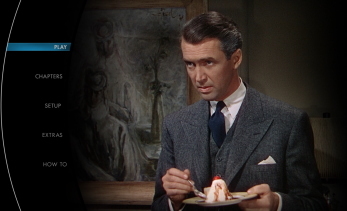 “There was one rather knotty problem that Jimmy Stewart, recalling his experiences in the Air Force, helped us solve. In the final moments of the story when the body is discovered and the killers are trapped, the apartment living room is flooded at intervals by great pulsations of light from a huge neon “Storage” sign just outside the window. I wanted the effect to add dramatic tension, much like the increasing crescendos of an orchestra at the climax of a symphony. But for a while our electrical experts were stumped. They knew that in order to get enough light into the room during the sign’s pulsations, huge arc lights would have to be hooked up on a special parallel with the actual sign – then synchronized. Then Stewart thought of the bomb release switch used in heavy bombers during the war. This switch controlled electrically the split second intervals during which bombs were dropped over the target. So we bought a bomb release at a war surplus store, adjusted it to synchronize the alternate flashing of the neon “Storage” sign with the opening and closing of these shutters on the three huge floodlights, and got exactly the effect we wanted. Those 200 miniature neon signs in the New York skyline cyclorama helped me solve a little problem of my own. It’s traditional, with me at least, that I appear fleetingly in every one of my pictures. But Rope, with a cast of only nine people who never leave the apartment, looked like the end of the Hitchcock tradition. There was just no way that I could get into the act. “Searching for what I demanded in a natural-seeming sky, I rejected the two routine methods of getting clouds. We could have painted them on the cyclorama, or we could have projected the clouds on the backdrop by means of painted lantern slides. But we did neither. I wanted the clouds to look like clouds even from ten feet away. It was Fred Ahern, our production manager, who found the solution to the puzzle. Ahern came up with the perfect light-reflecting substance — spun glass. (Cotton wouldn’t do because it soaks up and deadens light.) Five hundred pounds of spun glass were woven by scenic artists into chicken wire molds. Then actual clouds were photographed in all kinds of weather. We discovered that clouds are never the same even when the weather is constant, and it makes no difference what shape they are. Finally we decided on the cumulus or storm cloud, because it is white and fleecy before it turns gray and formidable. Every possible shaped cloud was created out of spun glass: wispy and full; fragile and menacing, circular and long. Music was also handled in an unusual manner. David Buttolph was the unaccredited composer of music heard in the film’s opening and closing credits, but only diegetic music is heard throughout the rest of the film. Therefore, we only hear music when Philip (Farley Granger) is seen playing Poulenc’s Perpetual Motion on the piano. One might notice that the title of the piece of music is rather revealing. The camera and the characters are almost always in motion, as are the minds of the two murderers and their guests. 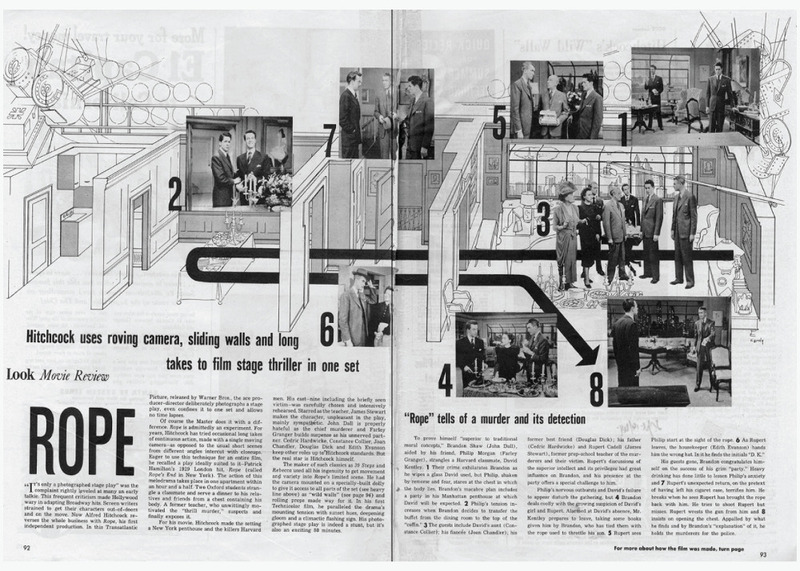 “…In the studio, the stage (actually a stage within a stage, made noiseless by constructing a special floor one and one-half inch above the regular one, soundproofed with layers of Celotex and carpet) was marked with numbered circles. These indicated where each specific camera stop had to be made, and when. Each camera movement — and there were as many as 30 separate ones — had its predetermined focus. Because of this the crew men operating the camera had to hit the floor markings exactly on cue and without deviations. 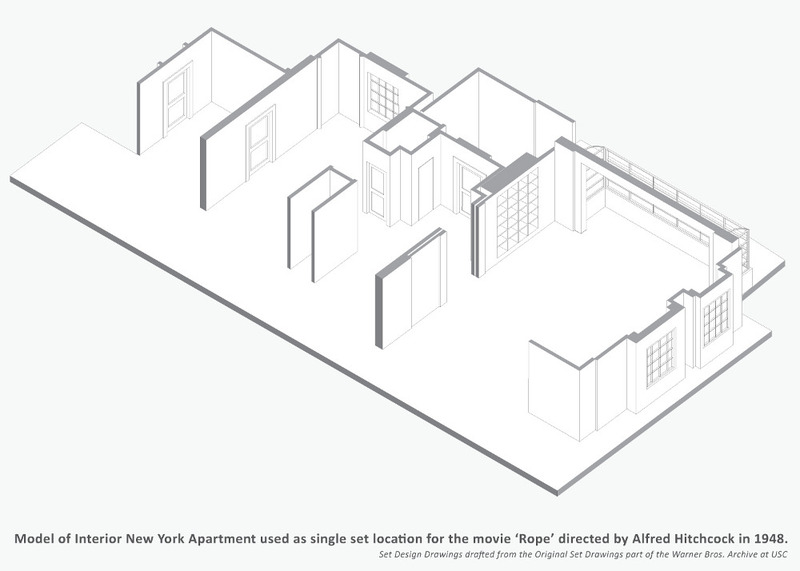 The entire floor plan was laid out in foot squares so that in the event of retakes we could go back to the exact spot. “…This chest with the body inside of it was always in the center of the living room — so far as the audience is aware. Yet, actually every time the camera crossed the room the chest had to be rolled off stage just in advance of the camera crane. (We couldn’t stop to make new camera setups.) Moving the chest was the assignment of the four prop men crouched on their hands and knees beneath the camera. Not only did they have to move the chest aside on cue but they also had to get it back into the scene again as the camera returned. Obviously, there was little editing to be done on the film once the re-shoots were complete. The completed film is made up of eleven shots (if one includes the opening credits). One can see that the common belief that all of the shots were ten minutes long is quite untrue. It is also untrue that the director masked every cut by having someone or something pass in front of the camera. The projectors of the era only held two magazines of film at a time. It was necessary to include a traditional cut on every other reel. This reviewer feels that these traditional cuts are less noticeable than those that are masked. For better or worse, the film was finished and all the director could do at this point was hope for success. A lot was riding on the film. Transatlantic Pictures and the director’s ego were in jeopardy. Alfred Hitchcock told Francois Truffaut that the film was well received, but a look at the major reviews written at the time of release tells a slightly different story. To say that reviews were mixed is being charitable. 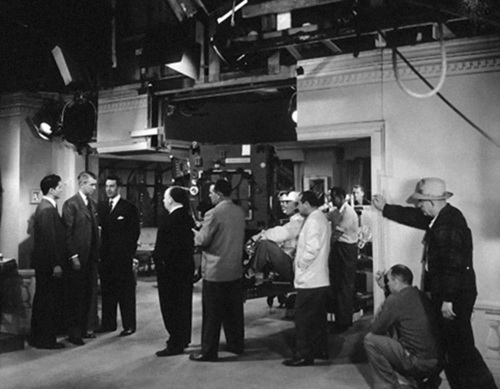 …The novelty of the picture is not in the drama itself, it being a plainly deliberate and rather thin exercise in suspense, but merely in the method which Mr. Hitchcock has used to stretch the intended tension for the length of the little stunt. And, with due regard for his daring (and for that of Transatlantic Films), one must bluntly observe that the method is neither effective nor does it appear that it could be. … The use of Technicolor makes for realism in contrasting hues, but maybe the mood of this story would have come over better in black-and-white. I agree with Truffaut. Scholarly opinion seems to be split today, but one feels that Rope cannot be discounted as ‘nonsensical.’ A look at the director’s work will show that the two films made for Transatlantic served the director well. Hitchcock’s style evolved because of his approach to these films. 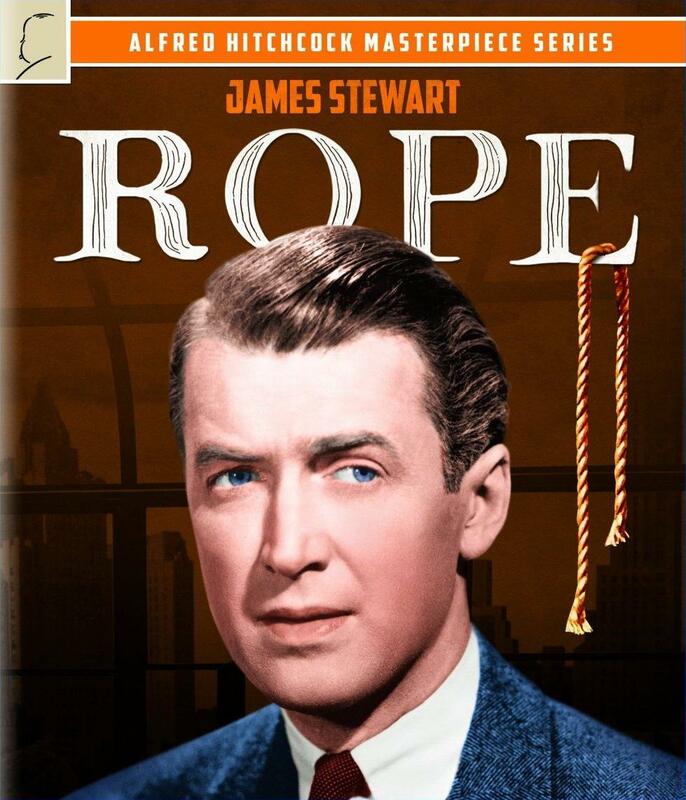 Rope is perhaps just as essential to the development of Hitchcock’s style as his move from Britain to America. The Masterpiece Collection is given a tasteful book-style presentation with a page for each film that includes a folder for each disc. Some might prefer that each disc come in its own standard Blu-ray case. These folder style compartments do not always protect the discs and very often cause scratches. While Universal’s 1080p transfer is certainly disappointing, it is a major improvement on previous home video releases of the film. Much of the film plays in medium or full shots, so the film benefits greatly from the added resolution. The 35mm photography is sometimes soft, but detail is often impressive in closer shots. The muted color pallet sometimes looks as if it isn’t properly represented, but this never becomes an obvious issue. There is occasional haloing and film damage is noticeable at times, but these issues are never distracting. One doubts that the film will ever look any better a home video format without a substantial amount of money being thrown into a restoration. The transfer looks much better than it has on any DVD release and fans will likely feel that it is worth upgrading to this disc. The included two-channel DTS-HD Master Audio Mono mix isn’t perfect either. Voices sometimes sound quite thin and the music tends to sound a bit muted at times. These issues never become a major problem, and dialogue is always clear and intelligible. There is little to no audible hiss to speak of either. The track will probably suit the requirements of most casual consumers. Any documentary on the making of Rope is certain to be interesting. Hume Cronyn discusses adapting the play into a treatment with Hitchcock, and screenwriter Arthur Laurents discusses his work on the screenplay, as well as the rather risque subtext of homosexuality in the film. This is an extremely informative documentary and its only flaw seems to be that there isn’t more information included about the unusual method that Hitchcock employed to shoot the film. This gallery offers promotional stills, posters, behind the scenes photographs, and lobby cards. Rope has an extremely interesting trailer that uses very little footage from the film. Instead, we see a glimpse of David and Janet before the former’s tragic death. James Stewart then addresses the audience as he discusses the case. Fans of the master of suspense and students of cinema should not be without this film in their collection. The importance of the film makes up for the slightly disappointing transfer (which is an improvement over previous home video releases).